The James River Blues: Blue catfish, cause or symptom of Bay health? Above: A group of TED-like Talk presenters and student poster exhibitors get together for a photo at the end of the day. Credit: Bobbie Moore/VASG. Lindenfeld is passionate about helping scientists communicate their work in more direct and engaging ways. She educates and supports them using the unique Alan Alda curriculum as they try to advance meaningful, productive interactions with communities, stakeholders, and decision-makers by strengthening the linkages between knowledge and action. Her work seeks to understand how we can build strong interdisciplinary teams and communicate science more effectively and persuasively. One might also add ‘enthusiastically’ because that is what Symposium participants noted both anecdotally and in post-Symposium surveys. Lindenfeld’s presentation by all counts set the bar for future events. Before introducing her, Hartley commented on one of the program’s emphases saying, “When we guide our fellows, we encourage them to engage with a professional stakeholder mentor so that their science can find impact with local coastal communities. By involving a mentor early on in the process it also teaches fellows how to communicate their science.” By taking this fellow-centric approach Virginia Sea Grant has seen a rich variety of disciplines represented in its fellowship applications. "One of the best conferences I have attended. Cousteau would have been proud!" The TED-like talks were examples of the diversity of partners and the wide-ranging fields they represent, varying in subject matter from oyster histology to resilient design to storm classification, and creating connectivity between water and land communities. Commenting on the Symposium, Professor Fred Dobbs, chair of the Ocean, Earth and Atmospheric Science Department at Old Dominion University said,"The trip to Glen Allen would have been worth it for the TED-like talks alone." An anonymous evaluator noted, "One of the best conferences I have attended. Cousteau would have been proud!" All TED-like talk presenters were coached by a local university partner and the VASG professional development program, and the judge's comments on their evaluations for the two winner's reflected this, "Great mix of science and storytelling, good sprinkling of jokes, great job starting and engaging your audience, your invitation to have the audience engage with you was very effective, great use of short concise sentences throughout, graphics are wonderful, good job setting up why we should care, and great opening and description of numbers/graphs throughout." Science-Policy Interface: A session on the science-policy interface explored how science is faring in coastal and marine policy today, when and why science makes a difference, and when and why it may not, along with the challenges and opportunities that exist for science moving forward in the current federal environment. Moderator Troy Hartley noted, "We had a wonderfully diverse panel with perspectives from the National Academies of Science, the U.S. Senate, and the NOAA Fisheries Science Center. Their remarks sparked probing questions and extended conversations; the audience left encouraged by the optimism and examples shared by the panelists." Science Communications: This session focused on the public brand of science - hope. It explored the importance of researching the topic further, the role efficacy plays, and of understanding the boundaries for it in the world of journalism. This panel consisted of Professor Katherine Rowan, director of the George Mason University Science Communication Department, Dr. Chris Volpe of ScienceCounts, and Tim Wheeler, managing editor of the Bay Journal. Hosted by the VASG Communications Center Manager, the group discussed experiences, a few best practices, and recent research for communicating hope in the current socio-cultural and political era. The discussion has sparked ongoing interest and commitment to developing new boundaries across all fields around the topic of hope. Science into Education: The Science into education panel introduced participants to the Virginia Scientists & Educators Alliance (VA SEA) which is a network of graduate students, teachers and informal educators working to transfer scientific knowledge to the K-12 community through the development of classroom lesson plans. "Attendees of the session seemed very excited about the project and the possibility of participating in the program themselves. They really appreciated hearing from the graduate student panelists who shared their experiences developing lesson plans for VA SEA, and how they found it to be an excellent way to both share their science with teachers and students, and reflect on their own research," noted panel host and Marine Education Program Leader at the Virginia Institute of Marine Science Lisa Lawrence. 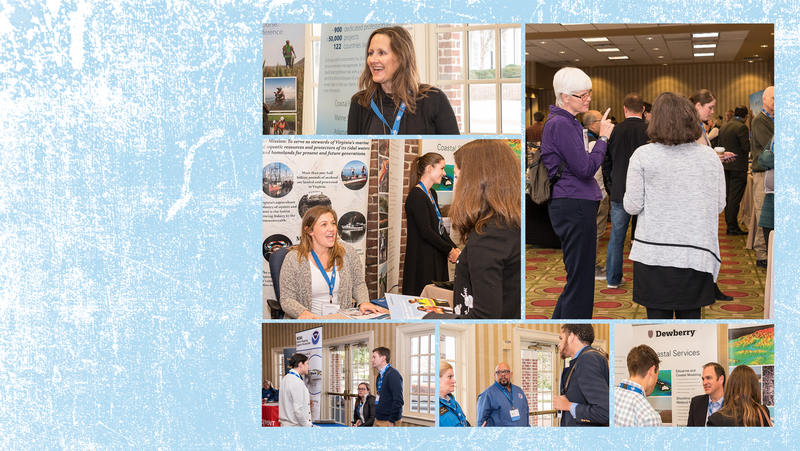 Establishing Engaging Partnerships: An interactive session designed to showcase examples of how NOAA Coastal Storms graduate fellows have successfully developed partnerships with stakeholders, communities, and agencies, and the positive outcomes from that outreach. Sam Lake, VASG's Fellowship and Research Program Coordinator noted that he was inspired by "the thoughtful questions students in the audience were asking their peers including advice on reaching out to potential partners, what lessons they have learned along the way, what mistakes they have made, etc. It's clear the next generation of scientists are actively thinking about how to take their science beyond the walls of their universities to engage with people who can benefit from their research. It's clear they want to make a real difference in their local communities." Poster presentations, a career exhibitor fair, and final presentations created by the 2018 cohort of Advanced Science Communication Seminar (ASCS) students rounded out the day. Virginia Sea Grant might be a small organization, but it enables good science, great community-level impacts, and outstanding coastal and marine partnerships. The Symposium is a key part of this, functioning as both a facilitator and demonstrator of that process.